In the interests of not having only ONE post in the month of May, I finished a book today! It actually wasn't a chore. It was quite delightful, and entertaining, and very light and sweet. But it also allows me to maintain my two books/month target, which is... well, not one book a week, but maybe we'll get up to three books next month? This is a book from one of my go-to authors when I'm having trouble reading anything. This time it worked! I was a little worried; the last time I tried a Julia Quinn it was a DNF for me. But I think I might have been unduly influenced by being sandwiched on a plane home from a vacation. But for me, this book was up there with my two Quinn favourites, The Lost Duke of Wyndham and An Offer from a Gentleman. In fact, it might... might... be better than either, though it would be hard pressed to top Lost Duke. It was a perfectly enjoyable regency romance, and it sparkled in a way that I've not found in too many other romance novels. So, let's see. We have the stunning Olivia Bevelstoke, daughter of the Earl of Rutland, in London for the Season. Her new next door neighbour is Sir Harry Valentine, who is, unbeknownst to her (and most others) an operative and translator for the War Office. To society, Sir Harry is a rather mysterious figure, a baronet, very sober, very solitary, and not a lot of fun. Due to a nasty rumour, Olivia takes to spying on Sir Harry from her bedroom -- and of course, he notices. Needless to say, they don't really get off on the right foot. The story is, of course, largely about Olivia and Harry getting back on the right foot. What made this read so enjoyable for me was the interaction between Harry and Olivia. Both are flawed but ultimately lovely people, and they tweak each other in just the right ways to make the growth of their relationship believable and entertaining. They are hilarious together, to be honest, and I genuinely liked them individually and especially when they're sparring with each other. The things they goad each other about, the things they say to each other go from being superficial and not at all polite to a growing, deepening relationship that clearly means a lot to each. The book does rely a little bit on the physical attraction between the two to get them from high dudgeon to good friends, and the friendship does happen a little quickly; but Quinn makes it clear that each intrigues the other, gets under the other's skin, enough to make the fact that they salvage a friendship plausible. All that aside, Quinn can write Society dialogue like no one else. It's not that her characters always know exactly the right thing to say, or always have a snappy comeback. No, it's that occasionally they do get mixed up or truculent or go silent, but they recover; and when they are on conversational form, they are a riot to observe. Even a discussion about the weather can be fraught with hidden meanings and emotion -- without being overwrought or overdeveloped. As always, the climax was a wee bit melodramatic, and in this case I really didn't feel it was necessary. There was a villain but as in the best of her books the villain turns out to have hidden depth (I still didn't like him much, but I was somewhat convinced that he might be redeemable) and the relationship between Harry and Olivia didn't really need an extra shot in the arm, the way the climax often provides in romance novels. It was all there, and I would have believed in their Happily Ever After even without the events at the climax. I really, really enjoyed myself throughout this book. 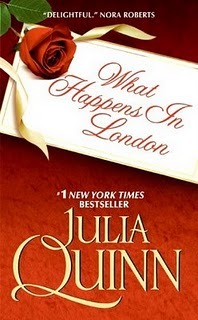 I giggled out loud in places, the romance was sweet and genuine and satisfying, and the plot was (for a Quinn) generally understated and perfectly enjoyable. In fact, this may be one of the few romances I could seen picking up again and enjoying a second time through, so I'll be on the lookout for a copy of my own.